What stops our everyday transportation from being eco-friendly? Despite amazing technological advances and growing environmental consciousness, we still drive around in gas-propelled cars, feeling vaguely guilty about the carbon footprint we leave behind. Economical electric transportation can seem like science fiction. How do we transform this science fiction into reality? Making rechargeable electric batteries more efficient, light, and safe will make electric cars (or volocopters, for those who want to fly to work instead) an option to consider. Rechargeable batteries already power our everyday business and communication in cellphones, tablets, and computers. Lithium-ion (Li-ion) batteries are most common due to their high efficiency. The first Li-ion batteries appeared in 1970s and have been constantly improving since. As the name implies, they use lithium ions, which move from anode to cathode during battery operation and back when charging. 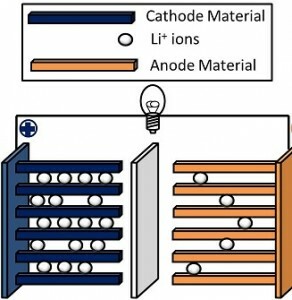 Li-ion batteries typically use intercalated lithium compounds (rather than highly reactive metallic lithium) as electrode materials. Typically, a rechargeable battery used in handheld electronics has a cathode made from high energy density lithium cobalt oxide, an electrolyte of lithium salt in an organic solvent (ethylene carbonate or diethyl carbonate), and a carbon anode doped with lithium ions. The anode is separated from the cathode by a permeable membrane designed to keep the electrodes apart and prevent electrical short circuits, while allowing the transport of lithium ions between the electrodes. In conjunction with other materials, polymers are used to maintain and enhance battery performance. Separators often are made from permeable polymer films and fibers. The separators must be chemically, electrochemically, thermally, and mechanically stable, and must possess the necessary pore size to allow ion permeability. Recent advances allow liquid electrolytes to be replaced by solid-state electrolytes, such as gel polymer electrolytes, which are composed of a polymer matrix and liquid electrolyte. This enhances flexibility and safety. Better yet, new composite gel polymer electrolytes can be written or printed directly on electrodes with complex geometries. Consisting of UV-curable acrylate-based polymer matrix, Li-ion liquid electrolyte and alumina nanoparticles as a functional filler, these shape-conformable micro-patterned polymer electrolytes can be obtained by UV-assisted nanoimprint lithography. Also, proprietary polymer coatings are used to protect reactive lithium metal anodes in new battery prototypes, which are made by Solid Energy (an MIT spin-off company) and promise a 30% increase the amount of stored energy. Here, inspired by nature, we apply self-healing chemistry to silicon microparticle (SiMP) anodes to overcome their short cycle-life. We show that anodes made from low-cost SiMPs (~3–8 µm), for which stable deep galvanostatic cycling was previously impossible, can now have an excellent cycle life when coated with a self-healing polymer. We attain a cycle life ten times longer than state-of-art anodes made from SiMPs and still retain a high capacity (up to ~3,000 mA h g(-1) ). Cracks and damage in the coating during cycling can be healed spontaneously by the randomly branched hydrogen-bonding polymer used. This self-healing property of this polymer is based on rapidly re-forming strong hydrogen bonds. Hydrogen bonds are normally formed between a hydrogen atom in one molecule and oxygen of a proximal molecule, and are responsible for the structure of water. Cooperative formation of hydrogen bonds is very common in nature, defining the 3-D shape and interaction of biological macromolecules, such as the DNA double helix, protein folding and antibody-antigen recognition. The electrode self-healing, carbon particle-containing polymer is similar to the previously described touch-sensitive polymer in artificial skin, using a polymer containing polar urea end groups to form unusually strong hydrogen bonds, as each oxygen in urea can form two hydrogen bonds instead of one. While scientist are rapidly improving the technology in Li-ion batteries, Tesla Motors is considering building the world’s biggest Li-ion battery factory in North America to meet the growing demand for electric cars, and the 2014 BMW i3 electric car went on sale in Europe this month and will be available in USA next year. Next Post: Plastics Recycling: A Cycle or a Dead End?